Our Shark’s Fin Melon Cucurbita ficifolia seeds were very popular last year and we are pleased to be able to offer them again this year. The seeds we have are from Sheffield (our original source of seed) as we did not have a good crop in our garden this year. Our seed donor grows Shark’s Fin Melons on an allotment in Sheffield. The plants seems to like the micro-climate offered by the city as she and her neighbours have had a bumper crop. A friend who lives down in the valley near us also had a good crop, so perhaps we are just a bit too high up at the Trust! Donations can be made through Pay Pal by pressing the button below, or you can contact us via our contact page to make a donation via bank transfer or cheque. 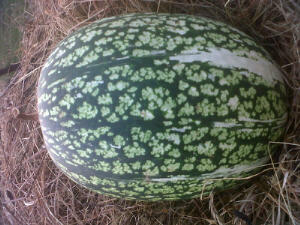 This entry was posted in Seed Saving and tagged Cucurbita Ficifolia, shark's fin melon seed, swap. Bookmark the permalink.